As kids, many of us resisted bedtime. As adults, many of us wish we could get more sleep. For those in the midst of learning something new, a good night’s sleep can be especially beneficial. Over the past several years, sleep researchers and neuroscientists have studied a process called memory consolidation, in which our brains integrate newly learned knowledge into long-term memory. Researchers believe that REM sleep helps facilitate this process. For example, researchers from the University of Haifa published a study in Nature Neuroscience in 2007 in which study participants who took a 90-minute nap after learning a task improved their ability to perform the task again later that day. In contrast, the participants who did not sleep did not demonstrate improved performance later in the day. in Germany trained subjects how to solve a math problem using a tedious method. Subjects practiced solving problems during the initial training session and again in another session 12 hours later. But there’s a twist: there was actually a much easier way to solve the problem, which the researchers did not teach to the participants. In the study, 59% of participants who got a night’s sleep between the sessions figured out the simpler method. Only 23% of participants without sleep between the two sessions figured it out. And there’s more! The November/December issue of Scientific American Mind has a special report that cites several studies about how sleep can help us remember and solve problems. It even suggests that we can train our dreams to help us creatively solve problems! How can we use this knowledge to benefit training? Let learners sleep on it. If learners must complete an eight-hour training session, consider spreading the training out over two days (maybe more) rather than making a full day of it. This can benefit attention spans, too. If all or part of the training is eLearning, you may have the ability to accomplish this more flexibly. We know that repeated practice benefits learning. Consider designing a course in which some of the practice occurs the next day. You could have learners complete eLearning with a case study today, and then practice those same skills with another case study exercise tomorrow. You could even test the sleep theory out yourself, by having some learners complete additional practice scenarios the same day as the rest of training while others complete the additional scenarios the next day, and then compare the performance of the two groups. Though admittedly, if the task is too simple, a significant difference between the two groups is probably unlikely. Have you heard about other sleep and memory consolidation studies? Do you think it makes sense to apply the studies’ findings to how we design training? This post is Part 2 in a series intended to list some ways to use Lectora that avoid problems, reduce development time, and make development easier overall. In Part 1, we covered how to optimize Lectora preferences for best performance. Now, we’ll go over handling variables and actions. Newer versions of Lectora name actions according to what they do, which is definitely better than nothing, but “OnMClkGoTo” isn’t always as insightful as “on click go to next page” or even “next page.” Choosing to name your actions and variables something short, understandable (to all developers), and consistent enables the ability to read through actions listed in the Title Explorer like lines of code without having to open the properties window. Quickly see which buttons have (or don’t have) actions in the Title Explorer instead of opening each one and looking at the “On Click” tab. Avoid confusion between both “On Click” tab actions and those added onto the object. If you’ve been using Lectora for any length of time, you’ll have noticed preview mode is much different than publishing to HTML. One subtle difference is the placement of “Go to” actions. For example, let’s say you have a button with two actions attached to it: one that modifies a variable and another linking to the next page (the “Go to” action). In preview mode, the link can occur first and the variable is still modified. However, in HTML the link occurs first taking the learner to the next page before any other actions occur, so the variable isn’t modified. Whoever handles phone calls to troubleshoot courses not completing in your organization’s LMS will thank you for following this simple best practice. Never attach any action tied to communication with an LMS, such as scoring and completion status, to a button. If possible, have them fire when the page first loads. While it may seem perfectly fine to add them to a button exiting the course, it risks the course exiting before the actions fire or the communication with the LMS completes. 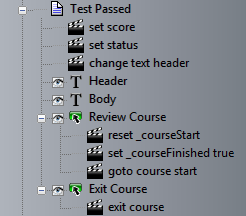 Aside from creating your own variables, Lectora has a useful set of reserved variables attached to every course. Although they cannot be altered, you can use them to pull information into your course such as the date, time, learner name, etc. There’s also reserved variables used to keep track of the current page, chapter, and section including the name, number, and total number of each. Knowing these are at your disposal can prevent you from trying to reinvent the wheel with a complicated series of actions and variables. If every page of your course has a page text header displaying the current page name, you can save some time and just place a single text box at the top of your title. This way, you can use a “change contents” action to change the text header of every page to display the reserved page name variable “CurrentPageName,” which is whatever you named the page in the Title Explorer. That’s just one example of how using actions and variables can dynamically affect objects. Other examples include using show and hide actions to restrict the next button from appearing and using reserved variables to create a “smart” next button. I recently read a commentary in Training magazine by Tim Hagen called Old Habits Die Hard. In the article, Tim references the importance of training reinforcement being an ongoing process beyond the training event itself, and even goes so far as to say that training reinforcement should be a long-term commitment, not just a once-and-done deal. This article, which talks about management support and reinforcement of training, made me realize that in design of instruction, we often forget about these critical resources that can either be our harshest critics or our greatest partners – managers. So how do we go about ensuring that managers reinforce and support their direct reports in what they learned through the training event, whether it be eLearning or classroom? We want them to be coaching their direct reports on how they can implement the new skills that they learned in our programs. After all, it is all about applying and implementing these skills on the job. Without application, the time away from the job is wasted time. Align your training programs across all levels of the organization – it is critical that all levels of your organization are speaking the same language when it comes to learning. Aligning all of your training programs for all levels is important. I was recently involved in designing a training program for Director-level managers. We actually started with the training that we provide to their direct reports, second level managers, and built the Director curriculum from that training. The idea was not so much to teach them new skills or concepts at that level, but it was all about gaining a strong understanding of what we were teaching their direct reports, and to have valuable dialog on best practices to support their learning and performance on the job. In the process, though, they learned new things from each other, which was the point of the course – interaction and collaboration. Without ensuring that it aligned with what their direct reports were learning, however, it would fail. Create post-training activities that have participants create learning plans and involve their managers – I have also been involved in a new hire training program for new 1st level managers in a sales organization. The training consisted of four one-week courses, with several weeks on the sales floor between each one to implement learnings. At the end of each course, the new manager was required to send an e-mail to their manager with an action plan, stating what they will implement and, most importantly, how their manager could support them in implementation. The participants were held accountable by knowing when they returned to the next class in the series, they were expected to give a report on what they implemented and how their manager supported it. When this activity was implemented, we informed the 2nd level managers of this activity, and of the importance of their support, so that they were on board with this process. For eLearning courses, require the manager to complete the course along with their direct reports – eLearning courses don’t have the benefit of an instructor to hold participants accountable, so what about holding the manager accountable to go through the same course(s) as their direct reports? In addition, it would be a good idea to implement post-course interaction such as discussion of the new skills/concepts in a team meeting or creating action plans for implementation. The manager would then meet one-on-one with the participant to ensure these skills are being applied. Manager s taking the same course ensures that they are on the same playing field as their team members, no matter how far removed from the actual work they might be. These are just a few suggestions. Have you had any other successful ideas for getting managers to reinforce and support the training for their teams? Feel free to share your experiences.